I get questioned occasionally about how to tell what it is that is making a scratching noise in a roof. "Is it rats, mice or birds........or elephants?" If you are hearing scratching or gnawing sounds in your roof void it is unlikely to be elephants (well, not fully grown ones) but what ever it is can sound 'pretty big.' Ceilings amplify sound like the sounding boards of musical instruments. And if the noises are heard at night when there is little other sound our ears are more sensitive and amplify the noise in our minds. A good guide to deciding whether the noise is caused by birds, rodents or other animals is the timing of the noises. If you are hearing the noise predominantly in the middle of the night, you almost certainly are sharing your home with rats or mice. If the noises are only occurring during the day or at dusk and dawn check around the eaves for birds entering and leaving. OK. So you are hearing the noises in the middle of the night. Is it rats or mice? Rats are larger and do make louder noise but that is little help if you have nothing to compare with. Listen instead for the frequency of the scurrying feet. Mice make a sound where their paw sounds follow each other so quickly it is very difficult to separate them, so the sound is almost continuous. The sound of rats running displays a more definite sound of their individual paws. Rats and mice have incisor teeth (front two teeth of each jaw) that are large and continually growing. The teeth have hard enamel on the front surface and softer dentine behind. As rats and mice gnaw they wear the teeth down and sharpen them into chisel like implements through uneven wearing. Rats and mice gnaw things other than food to keep their teeth worn down and sharp. Unfortunately for us they often choose to gnaw wiring, plumbing, joists and items stored where they are. If rats and mice regularly use a hole or gap to pass through they will gnaw around the gap to open it up and make it easier to enter or exit. They will gnaw wood, plastic, metal and even concrete if they need to. The sound of rats or mice gnawing can can be distinguished by the rate of biting. Mice gnaw at about 4-5 per second, rats 1-3 per second. In New Zealand the other animal that can be a cause of noises in the roof is the possum (Australian Brushtail Possum). This is a much larger animal than a rat or bird and it usually easy to tell its presence from the much heavier and slower footfalls and they don't gnaw wood like the rodents will. Other causes of sounds in a roof can be tree branches rubbing on the roof or eaves; usually heard only when the wind is blowing, or expansion and contraction of timbers and gutters as the roof warms up during the day or cools down at night. Why did the rats move into the roof? Because they heard the people say the cheese was high. Simply want to say your article is astonishing. The clearness in your post is simply spectacular and i can assume you are an expert on this field. Well with your permission allow me to grab your rss feed to keep up to date with forthcoming post. Thanks a million and please keep up the delightful work. Had that problem recently. Our situation ended up being raccoons in the attic. How did you guys get to remove the racoons ?? Where can the rats live in my house? I can hear the gnawing noise and scuffing steps in the early morning (between 5am~6am) on the first floor bedroom (our house is a 2-story house). My husband and I went to the attic and found no sign of rat / mice droppings ... Confused. What professional help can I get? The droppings of rodents are often left under insulation and in the walls etc. So you may not find them easily. But what you describe suggest there are rodents in the roof. The borer holes in our weatherboards are too small to get the injector nozzle into. Can you buy really tiny nozzles, or is there another way we could treat these? Thank you for your comment. The NO Borer Aerosol Injector (which I assume you are referring to) has a nozzle which one end fits into the can spray head, the other end is tapered and has a flange to prevent product blow back. The tapered end should push into the flight holes of common and native borer beetle. It may appear too large but you will find the flight holes are larger just inside the surface. Push the nozzle in and the hole will open up. This means a good seal is created when injecting and one is more able to see which holes have been injected. if the holes are still too small, I wonder whether the holes have been created by something else. Get back to me and I may be able to advise further. Hi David - thanks for your reply. It is the injector that comes with the "BV2 Borer Injector Spray" that I have. I managed to get it into some larger holes but 80% of holes are too small. Maybe I will look for the No Borer Aerosol injector to see if it is smaller. It is definitely borer holes. Hi David - thanks for your reply. It is the aerosol injector that comes with the BV2 Borer Injector Spray. I managed to get it into some of the larger holes but most are too small. Will look out for the other product to see if the injector is smaller. Hi David, Will a borer fumigator in a roof space make rodents leave or are they unaffected by it? If they do leave I imagine they'll come back when the smell goes. Despite suggestions to the contrary, Borafume fumigators or any other fumigators are unlikely to make rodent leave an area permanently. It is much more important to both prevent rodent access and to control those that are already using the roof space using rodenticides such as Kiwicare NO products. We can hear this constant scratching noise in our wall. We have a brick house and this is on the second floor It's noisy, constant and when we bang the wall nothing scurries it just keeps going. It sounds like a scratching. Thoughts?! It's freaking me out! Where in the world are you? Is the noise there day and night? If there are timbers in the wall there are insects that can make a constant noise that is often mistaken for scratching. Other possible explanations include a tree or other object scrapping the outside, is the noise still there on very still days? What you describe is almost certainly birds waking up and becoming active in the morning. There may be a nest in the roof. Thanks, David, for your great post. Would you please also let us know the solutions to the problem (mice or rats in the roof)? Thank you for your question. What part of the world are you in? There are many animals and insects that could be the cause. It could also be creaking due to heat expansion or contraction of materials in the wall. What you describe does not suggest rodents. It may be noises caused by contacting timers as they cool down at night or it could even be wood boring insects such as death watch beetle. Jeff, did you ever find out what you are dealing with? That exactly describes our situation. Scratching at night in vaulted ceiling. When I bang, it pauses, but nothing scampers, then it starts up again in just a few seconds. Thanks! I was woken at 1:30am this morning to a loud scratching sound in what appeared to be the loft and then moved to the wall above the window. We have had squirrels before but repaired all facia boards and I cannot see where anything would now be able to get in. Do you think it may be squirrels again or some other type of rodent? What should my next course of action be? If you had squirrels in your loft before, they are the most likely culprit. But also look for signs of rats and mice. Rats and mice can get in through smaller gaps than squirrels. A mouse can get through a gap as narrow as a pencil. If you can get into the loft take a look for droppings which would help you identify the noise maker/s. Give it a few days for the rat to take the bait. Rodents are neophobic and may ignore the bait for a few days then it will take a further few days for the bait to take effect. You could also put some bait in bait stations outside and around the house. The rat/s is likely to be moving in and out. As you are hearing the noises not long before dawn I would also check that the noise is not caused by birds. What you describe is typical of rodent activity. It is autumn in NZ and this is a mast year where more than normal seeds have been produced by trees. This has provided plenty of food for rats and mice in the wild and there is likely to be a great influx of rodents seeking food and shelter in homes and other buildings. Now is a good time to be pro-active and check for and seal possible entry points and place baits and traps in roof voids and other vulnerable parts of buildings. I live in Sydney Australia single story house steel frames no insulation at all between walls or roof cavity we, we have been hearing scratching in our wall behind our bedhead but we never hear it in other parts of our house we usually hear this at 10pm or 2am etc have not notice the scratching in the day, but then we have noise sometimes that sounds like something is rolling a rock through our roof sometimes it sounds like banging it's always so loud but I'd say that's because of the steel.frames these sounds can be about 6am again late at night, we also have a solid concrete raised foundation all, no trees or overhanging branches our bedroom wall shares its wall with our garage my husband did put baits up there along with traps, it would eat the cheese the trap didnt go off whatever it was stopped or didn't visit for about 4 weeks but is now back :/ our roof is hard to manoeuvre due to the location of the noise does any of this suggest anything? Your description does suggest rodents as the most likely cause. I suggest putting fresh rodenticide baits in the roof and traps. I don't recommend cheese as a bait for traps as it is fat that has 'gone off'. Chocolate or peanut butter are better baits. And be sure to fix rodenticide baits in place. Some rodents will take baits away to store (cache) them and it might be this that sounds like 'rolling a rock'. Thankyou so much for replying and for your advice! I will try this method. This is brilliant you answer enquiries for people! Hi David we live in England and can hear a squeaking/cooing noise coming from the wall/roof. We live in a terraced house with no attic. It almost sounds like a squeaky bed - we have asked the neighbour but the room directly next to our bedroom is a play room (they checked for any toys with batteries) so nobody in there at night and in the morning when the noise is at its most frequent and loudest. It is hard to know what the cause of the noise could be. What time/s of the day/night do you hear the noises? If it is birds you would expect most activity at dawn and dusk, but might also hear them through the day. If it is rodents you would expect most activity after dusk and before dawn, but might also hear them through the night. Also check for loose guttering and downpipes and trees or bushes close tot he house. Last thing at night say between 9pm & 11pm then 7/8ish in the morning. It's almost like a low chatter with hoots mixed in?!? No loose guttering or downpipes, trees etc..its coming from the top corner of ceiling where the eaves are. Can't say I've heard it in the daytime. As you live in England I think those timings suggest birds. 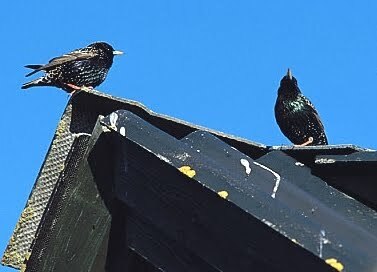 Birds, such as starlings, pigeons and sparrows will often nest I the eaves of buildings. Thank you for all your help, I'm really grateful. I will let you know how I get on. Rats are very good climbers and will often find their way into houses at the roof particularly if they got in some other way and then found an exit via the roof; they will remember the exit as an entry point. However, new infestations are much less likely to find their way in at a roof unless it is easily accessed by climbing vegetation etc. Block the entry point if possible and keep trees and climbing plants cut away from the roof. Your posts are very helpful, but I'm still not sure what It is that we have. We hear it in our ceiling. It seems that my daughter has heard it on and off for about a year, but today I heard it for the first time and it sounds like pitter patter or clicking sounds, kind of like beating your nails on a table rather fast. Also a sound, which was rather loud, like a cross between a frog sound and a bird (?). My daughter has heard the pitter patter sound but the vocal sound was new. We heard it around 3 pm in the afternoon. We thought at first it was a centipede which is common in Texas. Whatever help you can give would be so appreciative! Thanks! My knowledge of what particular problems might occur in a Lone Star State roof are a little lacking. But as well as the rodent, bird and vegetation possibilities mentioned above, I would also be considering insects. Perhaps crickets, cicadas, even wood boring beetles, some of which make a clicking sound in the timber e.g. deathwatch beetles. This? A different sound than what I was use to with the opposums. I cannot figure this out. After some close listening and research I learned we more than likely have mice living in our WALLS. None have come inside, that Ive found evidence of, YET. And Ive looked, with a high-powered flashlight, for droppings, behind appliances, in cabinets, etc. But! It SOUNDS like they are inside at times due hearing them thru the vents/ducts and now walls. They are ONLY around my bedroom though! My CLEAN bedroom, mind you. :/ In my walls and NOW running across my ceiling occasionally. :/ My room and bathroom are the ONLY rooms in the home that do NOT have the pitched roof. That means MY space is the only ones where they CAN get into the ceiling and have a roof still, over their heads without being INside our home (yet.) WE have hired someone now and he was convinced it is mice. He sat traps, I mean EVERYWHERE under our home. He examined areas around the home and only found 2 ways they COULD get in. 1.) around the BOTTOM part of our A/C unit (the part we DID NOT have covered. Eh, yeah, that wasnt on purpose. We thought it was done. Makes no sense NOT to have covered that! But anyway. 2nd spot is where they something found ONE slat of OLD underpinning (the ONLY one we didnt replace!) because its under our porch that is inaccessible (to US)! Ugggh! Well! 4 holes, yep the size of mice or a rat maybe. But we're told NOT to close off anything yet, as our wildlife/exterminator guy wants to allow them an exit (hopefully) while trying to treat. Again, about 30 traps (2 are RAT traps set with a RAT bait, different than the PB) but mouse traps are set with peanut butter on them UNDER the home. Now ALSO 3 bait stations nailed to the ground around our home too. This has been set up for a MONTH now. These are our results: ONE RAT trap was set OFF, nothing caught. (He thought it due it being a mouse and too small). I, at this point am thinking its NOT mice or rats, but have NO CLUE WHAT it is! Also, ONE something went into ONE bait station in this month. And we caught ONE very small, smallest Id (of he) has EVER seen of a mouse - a grown mouse too.) Thats it. In one month, thats the ONLY results. Meanwhile you ask? PART 3 here: Meanwhile, Im STILL hearing them in my walls! And I'll hear 5 DIFFERENT spots at once sometimes. Sounds like light knocking, sometimes I hear what maybe sounds like chewing, Ive heard something scratching itself before, Ive heard little pitter pats above my head in ceiling...and NOW a days, I hear them MORE during the day! Its at a fever pitch between 9am (really starts loud) and 6:30pm! Now, at night, its pretty quiet. I thought maybe, the reason for that is that they are going OUT of the walls at nightfall, looking for food, coming back in the morning to sleep. But! When are they EVER sleeping!? Im hearing them ALL day. And yeah, they do seem to slow down a few hours and sleep (cause I can still hear them in there, occasionally moving around) between like 1 and 4pm. But Im just SO confused! I DO know before he caught that little mouse, we DID have something chew a small hole in my bedroom wall, near the floor. Im ALWAYS checking the floors/walls being sure NOTHING new has occurred, so I caught this the same day it/they did it. And closed it up with steel wool and bitter-taste foam sealant. Nothing has messed with it since. I KNOW its NOT plumbing, as has been suggested too. No, plumbing doesnt stop making noise when you stomp on the area they are making noise and move to another location and start their noises there. Plumbing doesnt chew holes in the wall and plumbing certainly doesnt skitter across the ceiling, above my head! Yeah, our wildlife specialists is even stumped at this point and suggested this. It frustrated ME to no end though, as you can see by my reply to him! I made an audio tape for him too, as asked. You can hear all the noises on it and I was able to verify where each was coming from while listening to the recording play back. Im the only one who is THAT familiar. And that really is NOT a good thing. Im wore out by this! Again heres the list. Im trying to be thorough here, but, understand Im going without much sleep too and kinda wigged out at the though SOMETHING is gonna pop its ugly head up thru my floor at me, at ANY time too! NOT a good feeling. Continued below. Finally PART 4 of Angela Mitchell's post (I hope! IF it ALL fits here) If not, PART 5 will follow. -About 2" area/opening underneath A/C unit outside. - In floor (sub-flooring that is). Thats where the "knocking" noise is. - In/around my vent. The duct was replaced from opossums, but whatever is under there now has pulled the hose out of the metal duct (that leads to my register) again. I have NO A/C in my room, again! But they are plenty cool under there! Ugh! -around my window. Only one in here. But I can hear them at times around it, and even hear the glass ping, where they are close to frame. - I NEVER hear clear sounds of chewing. Or, IDK that its chewing. It just sounds like pop's, knocks, pings, skittering. I hear friction of something moving/sliding across walls interior. I also never hear squeaks etc...(and remember, Im in here almost 19-20 hours every day/night. & when Im not, Im recording. Hearing them at first at night mostly. Now? I hear them MOST in the morning between 8-9am until about 1-4pm. Between 4 & 6:30pm is when it gets QUIETEST in walls/ceiling, floor. Are they leaving then? Are they sleeping then? Ugh! Im SO confused, frustrated and desperate for identification, a solution and SLEEP! PLEASE HELP! ANY ideas you have I WILL explore. Oh! And wildlife guy DID agree to this when I mentioned it: Hes going to put a snake camera in wall his next visit. (He comes 2x per week). Problem is, when he comes, I can hear him under house, and I hear the creatures RUNNING UP the walls and into ceiling AWAY from him! So, since hes only gonna look around with camera WHILE HES HERE (they arent leaving it!) I fear we arent gonna know what it is. I need a camera set up for at least 24 hours I feel. But just so you know, he IS attempting to look around IN walls...soon. Im SO SORRY this is soo long. And Im so confused. AND tired. Forgive the time Ive taken from you, please. Just know I NEED HELP! And I appreciate you just reading this. Hi Angela, i have similar problem. I hear noises in my wall and/or attic but don't know what it is and it only happens during the day. The animal control group couldn't figure it out. Did you know what it was? Hi Angela, I have similar problem, where I only hear noises during the day in the wall and/or attic and can't find the exact location. the animal control said they don't know what it is. did you find out what it is/was? Difficult to know what caused the sound. I don't suspect the swallows as they are unlikely to go into the roof space. It might be mice that did not get caught in your traps, they can sound much bigger when running on the sounding board of the ceiling. Dogs are unlikely to deter rats so if they are about outside they might have found their way in. I suggest looking for signs under the insulation. I live in Brazil and I am living in a third floor with a roof of ceramic tiles on top of the normal concrete one. I constantly hear footsteps at night or early in the morning (from 00 h to 05 h). They really sound like human footsteps or people running without shoes. I live in an area where there are many birds, but i don't know if they're causing the sound because it is too loud to be birds. I also feel like whatever is up there scratches the roof, but for very little intervals. I have not heard any sound of birds, like birds noises or rats gnawing... which makes me more nervous. We don't have neither dogs nor cats and it would also be very hard for a cat to go up to our third floor. I it is difficult to know what could be causing the noises you are hearing on the roof. You don't say what part of Brazil you are in but could there be other animals walking on your roof? Another thing to consider would be creaking from the tiles/concrete as it cools down and shrinks? Very interesting info. I found this because we're getting the same strange hooting, squeaky, wheezy noises in the roof as Crystals ByCal (also in the UK). I've checked the roof space and exterior as best I can, though it's not possible to check all the corners in the roof, but haven't found any sign of birds. What I have found is bumblebees, though how they could possibly make little hooting noises is beyond me! Any thoughts? Or do I just have to look harder, maybe for an asthmatic rodent? I am not sure about hooting noises. But bumble bees can make a low hum and scratching noises a bit like mice gnawing. They have powerful mandibles and will chew wood for nest building. Thanks for the excellent article. I am being woken up between 5-7:30am because of what sounds like scurrying across the roof. We live in a new build with no attic or loft and have a flat roof. From your previous posts it suggest that this would be birds however the scurrying sounds too quick for birds. Birds, particularly when they become active in the morning will scurry around and sound quick. But I would not discount rodents. Have a look around the eaves for signs of birds coming and going. If they are nesting they will often drop nesting material. Hi I really need help ams advice! ! Ive just moved into a property and cam hear scratching/scurrying in the flat roof above the bathroom it can be at all different times of day/night if the bathroom windows been open and I slam it shut you hear "it" scurry away from the window!! Its driving me insane I cant sleep really need some advice on what it is. The two most likely possibilities are rodents or birds. Have a look around the eaves for signs of birds coming and going. If they are nesting they will often drop nesting material. If you don't see evidence of birds, then assume it is rodents and treat appropriately. Hey. I just moved into an apartment. My room is on the third floor, which I would consider an attic. About a week ago I started to hear things in the ceiling. Its a loud scratching sound, that continues even when I bang. It goes for 2-4 minutes then stops for a little then continues. It's always at night, usually around 12 am it starts. I live in Northeastern Pennsylvania, if that helps any. Hoping you could help. Thanks in advice. That the sound does not stop when you bang the ceiling suggests to me that you should investigate the possibility that the sound is due to contraction of the roof as it cools. Such can sound a lot lie scratching. Other things to consider would be a branch brushing the roof in the wind or the more obvious rodents, squirrels, etc. Hello. Thank you for your website. I am hearing a strange noise during daylight hours that sounds a bit like a squeaky bed. You know the sound you might hear if someone turned over. But the noise began with a loud tapping noise. Sounded like neighbours putting up shelves for hours. Could happen anytime of day even 5am (when light). But neighbours r not diy folk. Not a human mating bed hitting wall noise btw! Now the noise is just a squeaky creaky noise. Like a creature talking maybe.Have checked all our beds For squeaks. Its not the beds. Could it be owls Or bats or magpies? A lot of magpies here in Essex, UK. No scratching shuffling sounds. Help!! It is difficult to know what the cause of your mystery sound is. As you mention neighbours are you in a terrace or semi-detached house? If so there could be something living in the cavity between the houses. But more likely would be a branch rubbing against part of the exterior or expansion creaking from some part of the house timbers or gutter as they warm up during the day. It can be very difficult to identify where a sound is actually coming from so take a look all around the house outside and inside. I proudly caught a rat inside when it relocated to my place after my neighbour dug up her storm water drain. However I now think the scurrying/thumping on the roof and in the gutter at night could be another rat. I have arched ceilings so presume it must only be outside. Unfortunately my gutters are filled with leaves and weeds, results of living in the bush and being unwell for a year so I couldn't do my seasonal clean. I wonder if I only need to get my gutters cleaned or do I need to also use poison? Would I need to get my neighbours involved too, as I live in a block of 3 units, though mine is an end unit. I would recommend getting your gutters cleared out. The debris could be cover for rodents, but it might also be the cause of the noise, as twigs move in the wind etc. I would still recommend putting some rodenticide blocks around the property for a couple of weeks and if you can get you neighbours involved it makes control all the better for everyone. After a couple of weeks of baiting (in safe locations) you should have an idea from the bait taken, if any, of the size of the infestation and any need to continue. I live in northern Indiana and bought an "old" new house. Last fall we were hearing scratching noises in a front exterior wall and ceiling. We would hear these at night around dusk. During winter it was silent. Then this spring noises. My husband removed some ground cover and patched up some holes thinking the noise was mice, even tho we haven't seen any evidence. Noises stopped, for a while! I've been waking early the past few months and will hear the noises around 4-5am. It had been like just once a week but this week it's been every morning so far. Any ideas? There is a few times I hear a vibrating sound like wings maybe? We have a drop ceiling in the room and hubby says no way to see in there. We only hear the noises in the front corner of our down stairs room. No other rooms. The timing of the sound suggests birds. Sometimes the sound can appear to be coming from one place and it is really coming from somewhere else. Take a closes look around the house for signs of birds; droppings, dropped nesting material etc. It could still be rodents so have a good search for possible entry points. Mice need only a very small gap (pencil width) to get in. I live in South Florida and have noticed for several days now the sound of scratching, dragging, rolling and what sounds like something being dropped like cables in the walls and along exterior edges of roof line. At one point, I even heard what sounded like something hitting crystal or metal. These sounds only seem to happen between 11am and 1pm, oddly enough. What animal is active during this period? I hear nothing at night or in the morning. I know that there are squirrels, tree rats, large lizards and possibly possum in the immediate area. Any suggestions about what this could be? There' s only a crawl space above the ceiling, not a full attic. Thanks. I am not very familiar with the fauna of South Florida. But my suspicions would be for an animal in or on your roof. Go into the crawl space and take good look around the eaves for any entry points for animals. If you find any close them up when the 'animal' is not active and hopefully outside. However, I would also suggest having a check that there is not a cable or branch being blown and rubbing the roof. Thanks David. This animal has expanded its routine and now moves whenever and wherever it likes. It never seems to be in the same place twice. Now I hear it as early as 6:30am. It might be a squirrel that I have spotted in the yard but I can't imagine how or why it is suddenly in need of the roof. The entry points will be sealed and the branches removed but someone else is going to have to go into the crawl space. If this persists, I may have to consult a professional. Thanks again for your advice. We currently live in the north of England, and the bedroom of the house is an attic bedroom. From around 1am in the morning onwards we can hear a loud clicking noise, 4-5 clicks, then a pause and then it continues. It's driving us crazy! We've noticed wasps flying under some of the roof tiles and then appearing to come back out again. Is this the source of the noise and is it something to be concerned about? I would not expect wasps to be causing a loud clicking noise in the middle of the night. Clicks would suggest contraction noises as the roof, gutters etc. cool down or just maybe death watch beetle (check out the sound on Wikipedia). Other things to consider would be tree branches rubbing on the roof in wind, or rodents. Have a look in and on the roof. The wasps are not necessarily something to be concerned about unless they are bothering you in your garden or coming inside. The wasps will die off during winter. Thank you for your response! I find all of your info and responses on this page very interesting/useful. I'll certainly check out the death watch beetle on Wikipedia for a start. No trees in the area unfortunately, but I do think I might have heard the familiar scratching of feet early this morning, it's also an old property (not in the greatest of conditions) so I'm sure contraction will play a part! Thank you again, I will investigate further and be sure to let you know if I find anything interesting! I live in Auckland, NZ and have just found this post. I have been hearing a noise maybe once a week or so in our roof that sounds like it could be a mouse or rat. It is usually around 2-4 in the morning when I hear this noise right above my bedroom. No gnawing that I have noticed. The noise may be more frequent and I am simply sleeping through it, but it certainly is not every night. We have almost impossible access to the roof area, and multiple outdoor pets so leaving bait around the garden worries us. No droppings that we have found, but we did once have a mouse in the living room which makes me more convinced of the sound. Because it is rare to hear it, is it possible the mouse/mice are not actually living in there but simply keep returning every so often? Or is it more likely they have taken up residence somewhere in the house that I dont hear them? Also what is the likelihood of them gnawing a hole in a wall without me noticing? I am terrified I am going to wake up to mice in my room one morning. What would be your recommended course of action for our situation? Thank you so much for your time, my apologies for the long post. The noise is most likely to caused by rodents but take a look for a branch rubbing on the roof or other possible causes (see above). It should be possible to fix baits such as Kiwicare NO Rats Mice One Feed in the roof area, even with limited access. There would be no risk to your pets if they do not have access to it. Rodents do not gnaw holes in walls unless it is a route they have used previously that has been blocked. So I hope you will not find one in the living area of the house. If you have had a pest controller check your home and he/she saw droppings and confirmed mouse than I am confident that is what you have. Mouse droppings are much smaller than rat droppings, even those of a young rat. Mice can sound like 'a heard of elephants' when scurrying in a roof or gnawing. ; ceilings act as sounding boards and we are more sensitive to the sounds in the quiet of the wee hours. If bait stations have been left I am reasonably confident given a week or two you will be rodent free. Traps and bait stations often take a few day before the rodents become used to them and take the bait or 'risk' the trap. It is hard to know what might be causing the noise in your loft. Rodents and squirrels would certainly on my list of possibilities. Rodents, would be my number one. But don't discount birds, trees brushing against an eave or even expansion/contraction noises, all of which can sound a bit like scurrying animals. If you have insulation it may be worth looking underneath it for signs of rodent droppings. Hopefully the traps, when they arrive, will be the solution. Hello, I live in a 3rd floor condo that used to be apartments in Orlando, Florida. For about the past week, I've been hearing something running across and scratching inside my bedroom ceiling between 6 & 9am. Today, the noise started in my living room wall on the side of the couch. There are trees trees outside my window but the wind isn't high and when I walked around the side to see, I only saw squirrels but I wouldn't see rats or mice outside anyway. I'm curious and quite scared of whatever it is and who is responsible for fixing the problem, my landlord or the homeowners association? It is hard to know whether it is squirrels or birds causing the noise. 6 to 9 am might suggest birds. I can't say whether it is the responsibility of the landlord or homeowners association, the answer may be in your rental agreement/contract. I would contact both and ask for help to identify the source problem. About a month ago, we moved into a new home in Texas with a lot of wildlife in our backyard (trees - squirrels, bugs, some roaches, maybe a bat, etc.) and it's starting to get cool outside at night now. Last night we heard a digging sort-of sound that seemed in our wall. It could have been from the attic above that room, or even outside on the roof. We turned on a light, got up, & saw nothing. It stopped. Went back to bed and it started again 15 mins later. We turned on our outside light and never heard it the rest of the night. Any thoughts as to what would be reluctant to move with the lights on? Thanks so much! It is impossible to say what was causing the noise but the squirrels and bats you mentioned would be on my list of suspicion along with rodents and any other mammals you might have living close to you. I am still not sure what is living on my roof. I live in Canberra, Australia, I have been hearing noises that sound like biting/ scratching for almost 2 months now, it used to be only during the day and never after nightfall. However since a few days, it's now happening constantly 24/7. I was sure it would be rats, but after reading your post, I am not so sure anymore. It seems to be coming from the same location everytime, which makes me think that it could be a bird's nest, but again, it's hard to pin-point for sure. I can't easily check the rooftop (no easy access) but one time I saw a crimson rosella (a native Australian bird) fly off as I was trying to look on the roof, and the noise stopped for a few hours after that. Coincidence? Maybe...maybe not? It does sound like birds are possibly nesting. At first you heard the noises during the day as they built the nest. Now there is activity all the time as the nest may have young in it. We live in northern California, in the lower Sierra foothills, at about 3500'. We have grey squirrels and the smaller Douglas squirrel (relative of the notorious red squirrel) here. Our home is 2-story, with dormers. The roof is asphalt shingle, sloped on one side and flat on the back. Over the past 15 years, we've had issues with the grey squirrels chewing through the "triangle area" created where the dormer meets the sloped shingle roof. After eradicating them, we built several triangle-shaped frames to fit the space, and covered them with hardware cloth--no more problems. Now, however, we have infrequent scratching noises from the roof after dark, at about 11 pm or around 2-3 am. These noises are in a different area than before, and loud enough to wake me up after being fully asleep. (Luckily, they occur once or twice, and then we go weeks without them.) When we grab a flashlight and check outside, nothing can be seen. There are no overhanging branches and the roof area is kept clean of pine needles, etc., because of the current extreme drought in California (fire danger). Could this be a raccoon, come to play? We do have other nocturnal critters in this rural area (skunk, opossum, bear), and have seen all of them at different times. Any ideas? With so many 'critters' in your area it is difficult to know which is causing the noise, but top of my list of suspicion would be rats or mice. Thanks for reading. We're going to go up into the void (I mean, my HUSBAND will be going up there) to look around and I'll let you know what he finds.... Your site is great and gives good, straightforward information. For the past 2 nights, we have been hearing a scratching sound in between the ceiling and roof. it goes on between 2-4am. we banged the roof in the hope that whatever it is will scurry away, but no luck. it just keeps scratching just the roof space in our room only and no other part of the house. We cannot sleep once it starts. we live in Lagos, Nigeria. What could it possibly be as we are unable to sleep. What remedies are available? It is difficult to know what is causing the scratching in your ceiling. If it doesn't scurry away when you bang on the ceiling it may suggest a mechanical cause rather than an animal. Hi, I live in the UK and I'm hearing the occasional scurry and loud scratching mainly in one area of the ceiling above my front bedroom in my bungalow. I hear it around dusk and dawn but have head it during the day too in the morning and at lunchtime. It can occasionally be heard in other areas of the house but always tends to be around the external perimeter/ the flat roof we have above the extension at the side of the house. This morning around 730am above the usual place in my front bedroom it was very loud and then suddenly stopped...I heard no scurrying as if it had gone elsewhere in the house but did hear a bird tweet and fly at the same time it stopped. This could be a coincidence or wishful thinking though! It is difficult to inspect this area of the loft as it is a small section which does not run into the main loft apart from via a small hole. When my landlord tried to get in that hole there was no evidence of droppings or smell. My landlord informs me they have had rats before and on Saturday made sure that the pipe at the back of the house where they used to get in was completely sealed. Do we need to take the eves off to know what we are dealing with? It was so loud this morning but I found it strange how it stopped dead. Please help, I'm going out if my mind! Hi, I am hearing loud scratching noises and the occasional scurry mainly above my front bedroom but sometimes on the flat roof of my extension or in other areas around the house but always around the external perimeter. It is only occasional and tends to be at dusk and dawn but I've also heard it around 1pm during the day and during the morning. My landlord admits they have had rats so ensured that the pipe was fully sealed on Saturday which used to be their entry point at the back of the house into the loft. Touch wood I've never heard it in the main loft space, only in a small area of the loft space above my front bedroom which doesn't join the main loft space apart from a small hole. My landlord has tried to squeeze through this hole but could not see any droppings or smell anything in that space. This morning at 730am the scratching was so loud, then I heard some bird tweets and a bird flying and then all noises stopped, I'm thinking it could be a coincidence or wishful thinking though! I darent sleep in there now but when I was sleeping in there I think I only tended to hear it in the early hours of the morning 6-7am when the heating comes on and it starts to get light. Do we need to remove the eves to see what we are dealing with? Could it be in a space 'between' the ceiling and the lift space hence why we are not seeing any evidence? Also I have an extractor fan in the ensuite to this room, it is grated plastic both sides but is it still possible that something could get in here? Please help as I am losing sleep and mind! If it were spring or summer in the UK I would be pretty sure what you describe is birds. But at this time of year the possibility of rodents is greater. It could still be birds roosting in your eaves or on the edge of the roof/gutter. The best way to know would be to take the time to stand outside the area in question at the usual time you hear noises and watch for birds coming or going. It might be 15 minutes well worth preserving you mind. If there is no evidence of birds then rodents will be the most likely culprits and you should place some rodenticide and/or traps in the roof and in bait stations outside. Also consider the possibilities of thermal expansion/contraction, trees brushing the roof in the wind and other animals such as squirrels. Is very difficult to seal buildings against rats or mice. A mouse can squeeze through a gap as narrow as a pencil and a young rat needs little more space. I recommend getting rid of the rats (or mice) and then sealing up gaps inside and outside where rodents can travel. If the gaps are sealed while the infestation still exists. The rodents will gnaw through to open the gap again, particularly if it was either a commonly used route or they need to get through to reach their nest/food/exit etc. I have seen cases where rats have gnawed through concrete to escape. 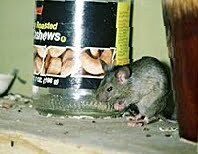 I recommend dealing with the infestation using bait and/or traps and then thoroughly looking for and sealing possible rodent entry points. I can hear noises in my loft space late at night and early in the morning. I believe it could be a mouse. The problem I have is that my loft has been converted and laminate flooring is down. I have storage space in the eaves that is also boarded. I can only hear them in the loft space (no entry to the inside of the house). Is there a way of setting traps/poison without having to 'rip' the floor up? It is very unlikely that the floor in your lofts and storage space has been so well put down that there is not a way for the mouse/mice to get from under the flooring and into the storage space. I recommend placing both rodenticide bait and traps in the storage areas. Check them regularly. Only if you do not catch any mice and the bait is not taken would I consider lifting a section of floor. The sound is almost certainly caused by one or more rodents. Although your husband has looked for gaps, mice can squeeze through gaps as narrow as a pencil and rats not much larger. As your house is a semi-detached even if there were no such entry points on your side (unlikely) there could be on the neighbouring property. Not seeing droppings is not unusual. If you have insulation in the loft they could be underneath that. Sonic deterrents are not very useful and rodents can be shy of traps. It sounds like you have made your own rodent bait. I recommend replacing it with a proprietary bait as these are formulated and tested to be attractive to rodents and effective. Place bait in several points with in the roof void. I hear a slow, gnawing and scratching sounds coming from my attic at 5 AM almost every day. I live in NYC, USA. It stops when I bang on the ceiling or play angry cat sounds from my cel phone. I live in a frame house with stucco. We had mice in the kitchen before, but that is under control. What do you think it is and how can we get rid of it? I fear you have mice (or another rodent) again in your attic. If you are to access the attic I recommend placing some rodenticide and traps in the space. It may take a few days but you should be able to get rid of them. I have a vaulted ceiling, could there still be pests in there? Last night I was watching tv around 9pm and I heard a scratching noise that didnt stop much and it went on for a few minutes. I went outside and shone a flashlight on the spot and I couldnt see anything in that spot because the roof met the garage roof at a different angle and it appears the snow had fallen so there was a pocket with no snow in there. I have heard other sounds before on my roof but sounds that sounded like it could have just been the wind. This was very different. Any ideas what this could be? And could something still be living in a vaulted ceiling Or in the wall conected to the garage? It is possible for rodents and other small animals to live in the spaces between ceiling and roof iron or tiles in vaulted roofs. I am reading , this in the morning. I could not sleep,due to thumping noises coming , seems like the baseboards near my bed. Stops, then continues 20 minutes again, thumping. I also notice that the lights in the kitchen are flickering. We had mice last year. I called the pest control, they used some bait, over a year ago. Seemed to stop. I do not see droppings. The noise is early morning 5 to 6"30 am. What would be your suggestion..Live in Toronto Canada Thankyou any advice would be very appreciated. There could be an animal of some description in the wall. I think in Canada it could be rodents, squirrel, possum, birds, etc. I recommend taking a close look around the exterior of the house for any signs of animals entering at the eaves or other places. I hear scratching noises in my ceiling, the scratching starts between 11pm and 3Am. whatever Is up there scratches for 30 minutes and moves about a foot and then starts scratching again. But I do not hear moving I just hear that the scratching went from one place to another. I also do not have any access to my ceiling. Can you please give me some kind of guidance? I think the most likely cause of the noises is rodents. It may be possible to place bait and/or traps in other parts of the house and around the exterior in bait stations. The rodents will be exiting the roof to search for food each night and should find the traps or bait. Is the area of wall on the sunny side of the house? That you mention you tend to hear the sound when the sun is shinning suggests the possibility that the noise is due to something expending in the wall as it heats up. But it could also be the reaction of an animal is it becomes more active in the 'hot' wall. My guess would be expansion noises as you don't hear noises at night. Thanks David. I guess i have a little update to add: I still hear the noises i was hearing last year when i posted on this thread. But I realized it's mainly in the day time but it sometimes it happens night time/early morning from 3-5am but definitely in the morning till 12pm or 1pm. What I notice is that i hear it when its really cold winter not much during other seasons. Thanks again. but i heard animal scartches, also when i tap the wall, the noise stops. The problem is I cant pin point the exact location. I am hearing scratching and scurrying noises in between my first floor and second floor bedrooms between 4am-6am near the edges of the house by the gutters. It's almost as if it enters near the gutter and squeezes in somehow. The noises are above me in the first floor bedroom and below me in the second floor bedroom. The fact that the noises are on the edges of the house make me think it is not actually inside. Any ideas? If there is any access from the exterior to the floor between the first and second floor I would guess there were birds nesting there. If not then the likely culprits are rodents or other animals that have found their way in. Have you seen any other evidence of rodents e.g. droppings in the roof void? Other things to check for would be a bush or tree rubbing against the wall outside or expansion/contraction noises from piping or other items. My name is Eloise and I have a noise which occurs either in my wall cavity around my window frame or in the roof space. It is a brick house with a timber frame. The noise occurs between midnight and 5 am for about 20 minutes each time and a couple of times each night. After tapping the wall or the ceiling it will stop for a few seconds then recommence. It sounds like something is incessantly rubbing a small rock back and forth. Whatever it is has dropped the object a couple of times and it is a small hard object with a rough surface. Whatever it is seems quite light on its feet as I don't hear any footsteps. A few weeks ago I also heard some light scurrying and scratching so I put some rodenticide throw packs in the roof cavity and they have stopped. I have thrown some more rodenticide butwhatever this is obviously hasn't taken the bait. I have not seen an entry/exit point into the roof cavity, nor have I seen any droppings. I assume it is either a rat or a mouse, what it is doing I have no idea. If you have any advice as to what it is and how to get rid of it would love know. My name is Eloise and I have a noise which occurs either in my roof or wall cavity around the window frame. Between midnight and 5 am for about 20 minutes each time and a couple of times most nights something is incessantly rubbing a small rock back and forth. In the past I have heard light scurrying and scratching, after using rodenticide in throw packs I no longer hear that. I don't tend to hear any footsteps just rock rubbing. It has dropped the item and definitely sounds like a small rock. I have not seen an entry or exit point nor have I seen any droppings. I assume it is probably a mouse or rat, either way it hasn't been tempted but the rodenticide in the throw packs. If you have any advice as to what you think it might be and how to get rid of it, it would be greatly appreciated. I agree that the most likely cause is a rodent. I recommend changing the rodenticide. It may be that the particular animal is shy of the bait you have been using. Remove the throw packs if you can. Hopefully a change in bait will attract and control the rodent. Yes. Bats will make scratching noises and would become active soon after the sun sets. It would explain why the bait and ttraps have not been touched. 3. I work at home so I am privy to other times of the day, but no scratching. Do you hear the noises right before sunset as well? Bats are a possibility. The light on in the attic is unlikely to deter them if they made the eaves or wall home. The other likely noise makers are birds and maybe squirrels (if you have them there?). It might pay to take 15-20 minutes and observe the area from outside at the time you tend to hear the noises. You might be able to spot what it is arriving or leaving. For the last two nights I have been hearing scratching in a top corner of my bedroom, vaulted ceiling. Its at the top corner of an exterior wall. The scratching sound is heard at night when I go to bed around 8-9pm and continues until I fall asleep. I climbed on top of my nightstand to listen more closely and it sounds like scratching or gnawing on wood. I have not yet heard any animal sound like squeaking or otherwise. When I knock on the ceiling and area around the corner, the scratching sound still continues without pausing. I also hear this sound in the morning. It is presently 8:30am and I have been listening to it for the last 90 minutes. It is constant. What are your thoughts? If possibly a rodent, could it chew its way into my bedroom through the ceiling or wall? And if a rodent, why am I hearing this sound both during the day and at night time? I looked outside but couldn't see anything. My gutters have covers on them as well. Any insight would be greatly appreciated. Thank you so much! That the sound continues constantly, even when you knock, suggests to me that it is not caused by rodents or birds, or any other animal. I would consider the possibility of a branch rubbing against the exterior in the breeze, expansion sounds as wood warms or cools, pipework/plumbing making a noise with warming or cooling or water movement, or even (and I don't know where it the world you are) insects damaging the wood e.g. deathwatch beetle. Note that sounds can be deceptive and appear to come from one place while in fact being created somewhere else and resonating or reflecting in spaces. I used to live in an old stone cottage in Northern Ireland. I loved the 3-4 ft thick stone walls. There were noises from pipework and expansion/contraction of old timbers. Your description does not suggest rodents or birds. If your timbers are old there are one or two other possibilities; deathwatch beetle. Although rare as far north as Scotland, this beetle infects wood and makes a clicking sound, or could the wind be moving something under the floorboards? If you are hearing the noise at 4-4.30am and this is about dawn where you are, I would suspect birds or some other animal waking up and becoming active ready for the day of feeding outside. It is very difficult to identify what might be causing the noises in your ceiling. I am assuming you were hearing the noises in the early hours of the morning. The description of scrambling does suggest an animal. In SA this could be any number of animals that could get into a ceiling/roof. But even in SA with many possibilities I think the most likely is rats or birds. If you can access the ceiling space in daylight hours take a look for any signs; droppings, nesting material etc. that can give you an idea of what the cause is. If there are no signs than do not discount the possibility of expansion/contraction noises or vegetation rubbing against the roof or walls. At night these can seem very like animals. I live in the UK and have recently moved into a new flat. The house itself I think is a bit older (wouldn't be able to say how old because I'm bad at guessing things like that but certainly offering many places for rodents etc. to get in I would say). The flat is on the first floor and when we moved in it wasn't exactly clean (mostly dusty, but the floor and also curtains had stains on it which I now think may be droppings which were stood on? - for the floor, the curtains look like they actually have dried droppings on too? - pretty big ones too). After I woke up today I heard noises from the wall next to my bed and where my desk is (at 7.30 a.m.). This is also the only wall with windows. It sounded a bit like gnawing or clicking (but duller, a bit like the sound you make if you smack your lips?) and I tried banging it but it is hard to tell if that had any effect, as the sound only came kinda infrequently anyway. At first I thought I may have heard some scurrying after I banged (but very quietly, like rainfall) but later the noise only stopped for a while and then picked up again (although I don't know if that was just the usual interval, as I said it was infrequent anyway). I'm not sure how to find out whether it's rodents or just something to do with the pipes perhaps (the place I heard it at mostly is directly next to the boiler, and I have been to the bathroom before I heard it, however, the heating isn't on). The noise has mostly died down now (10 a.m.) and in the last half hour but it does come even less frequently than before. I don't know if that is because whatever is living there is less active now or because it's a mechanical issue that is getting less now? Any thoughts on this would be appreciated. Thank you. It is hard to know what may be causing the noises in your wall. It could be rodents, but they tend to be most active at night. It could be birds and they tend to n=be most active in their nest at dusk and dawn. It could also be expansion noises from pipes or timbers, these can happen at any time but are most common when things are warming or cooling. It could also be a tree or bush rubbing on some part of the house in the wind. If you think it might be rodents look for fresh droppings in roof voids, sub-floors, and other voids. Fresh droppings are not dusty but shinny. I hope that helps and you solve the mystery. Hi, sometimes in the late night or early morning I can hear a scratching or gnawing inside one of my walls in my bedroom on the second floor of my house. If I bang on the wall a couple of times it stops but I have to do it a few times. I have trees pretty close to my house. It sounds more like something is chewing as opposed to scurrying around. And it's loud. It's definitely inside the wall and not on the outside. It is hard to be sure but it does sound like rodents or some other animal may be in your wall. I recommend searching for signs in your roof void and any other voids around the house. Also take a look around the exterior to see if there are any possible entry/exit points in the vicinity. Fix some rodenticide bait in roof voids and other suitable safe places and monitor to see if any bait is consumed. I have moved into a house about a month now and I have been hearing scurrying sounds in my roof from time to time. It happens at various times-sometimes at nights,during the daytime and some mornings. The roof is concrete. We do have two big mango trees at the side of the house. Sometimes you will find ripe mangoes eaten out that have fallen to the ground. I have seen birds in the trees too. The only thing that we sometime have problems with inside the house are lizards. I am not familiar with all the animals of Jamaica but there are likely to be many that could be causing scurrying noises in your roof. You have identified lizards, I am guessing there could also be rodents, birds, bats, and others. For the last 3days I've been hearing these scratching noises in my room. First it was on the side of my bed now I'm hearing the same noice by my dresser. My Mom said "Oh it's just a squirrel in the roof" but I know that's not the case. I hear the scratching mostly at midnight when its very quiet. I am scared to even get out of bed! And im not getting very much sleep. What should I do? Your Mum could be right but I would put out some rodent bait behind the dresser and check it every day for a week. If it is not a mouse or rat there will not be any bait eaten. Could there be other causes? Wind rustling tree branch outside? Expansion contraction noise from pipes or guttering? Things sound much louder in the quietness of midnight. Yes, possum can be found in Australia, they move slower and gnaws slower than rodents. Even the cleanest home have unwelcome guests wandering around their house at the wee hours. Regular pest inspection and good treatment plan can be done to at least eradicate these pests. I wonder if there could be a bumble bee, honey bee or wasp nest in the wall of your house. I recommend examining the outside of the house around the wall where you are hearing the noise. Look for stream of insects going back and forth to an air vent or gap at the eaves. Thank you David, you are right on the money - appears I have bees entering thru the spacing under one of the concrete roof tiles. I should have put 2 and 2 together, I've had bees nest in an old toy box outside before, and they were swarming around the area a couple of weeks back. Most helpful, thanks again! For about 4 months now, I've been living in an upper floor flat in a row of Victorian terraced conversions in London. Shortly after I moved in I found a dead mouse in the kitchen where poison traps had been laid previously. I disposed of the corpse but did not panic because I had seen no other evidence of an infestation - no droppings anywhere. A few months later, I caught a live mouse in the waste paper basket in my bedroom! Then a couple of nights after that I began to hear a very loud gnawing sound coming from the wall behind my wardrobe, starting at about 4.30am. I'm certain it's rodents making the noise, but I don't know how to get rid of them if they're in the walls of a terraced Victorian house. They've made it to the first floor of the property. Should get pest control to check my loft or could this be an issue with my neighbours? My landlord did mention something about my neighbours next door (not below) being an issue. Thanks so much for taking the time to respond to us all. It's really kind. You should put some rodenticide and traps in the roof void, and any other 'out of the way' places that rodents may have access; hot tank cupboard, behind fridge/freezer, in sub-floor, etc. I also recommend speaking to your landlord, especially if he is landlord of the properties either side of you, it would be best to treat all the terrace at the same time; the rodents see it as one building. Hello David. I had a couple questions I was hoping you could answer for me. Currently I am living in my grandmothers spare room in the backyard and she has had problems with roof rats for some time now. I would see them almost every night as I went to my room and I used to not hear anything in the walls but this past week its been raining a lot and its certainly gotten a lot colder and now through the majority of the night from like 11pm-6amish I hear constant scratching. Not just from one spot either, from like 4 or 5 different spots(and I have quite a small room) and I am worried that very soon they will make holes into my room. I was wondering if you knew of any methods to help me get rid of them. Without control, the rats will increase in numbers and will only be limited by their ability to find food and shelter. It sounds like they have found the shelter in the walls and roof of your home. Make sure that food is limited by sealing all foodstuffs away and clearing up spills. Then fix rodenticide in safe places such as the roof void, hot water tank cupboard, sub-floors, etc., out of the reach of any children or pets. You may also set traps but rodenticides are the most effective and efficient way of getting rid of rats. Once you have controlled them and you are not seeing or hearing any more, check around your buildings for entry points (gaps under doors, at eaves, broken vents etc) and seal these up to prevent rats gaining easy entry again. Hi David. Great site. I have had no idea where to begin, who to call, if I should be overly concerned, etc. Every morning between 7-9 a.m. I hear loud scratching sounds coming from what sounds like the walls in my master bedroom. I'm hoping (I think) that it's birds based on what I'm reading here. But I have no idea where to look or what to do even if it is. House is single story and master ceiling is very high and makes up an entire corner of the house. I suppose the noise could be echoing down the walls to sound lower than it is. Any advice? I think you are correct that birds are the most likely cause of the noise. You may be able to see the birds leaving from somewhere in the eaves. Or see nesting material or droppings at the point at the eaves where they enter and leave. If you have the patience you might go outside and watch for the birds leaving at the time you hear them in the morning. Thanks for the reply. After further inspection I found a large hole and pretty substantial chew marks around the entrance. It appears to be squirrels, or maybe even rats, but I've not yet seen then. I'm thinking of an exclusion trap or 1 way exit to try and keep them out once they exit. Then reinforce the entry with steel or something they can't chew back through. I'm considering a professional for the job but I'm on the fence of spending several hundred dollars for something I could potentially do myself. This is such an awesome post. Answers my question right away! Your advice and guidance has been fantastic to many and I've tried the organic approach to eradicating mice with essential peppermint oil sprayed on surfaces. Unfortunately this hasn't worked. The mice are not leaving a particular area and that's beneath a double wardrobe where the surface of the base has a gap and they've entered the foundation to the large wardrobe against a wall. Please share your thoughts on how to tackle this infestation in the corner of the bedroom. The room actually has only a swingle bed and two side cabinets. It's very simply furnished so that the wardrobe contains all accessories, books and clothes. This means that the bedroom is completely clutter free so I continue to wonder why the mice remain where they are and when will they leave? What is their supply of survival food when the kitchen remains clear from all boxed and refrigerated foods? Unfortunately the mice will remain as they are not there just for food but also for shelter. What you have done is good but you will have to control the mice with rodenticide and or traps. The removal of clutter and exclusion of food from rodents will then help to stop new infestations. David, I happened onto this post by accident, while searching for the source of some scratching sound, coming from the intersecting corner of my LR & BR. I am glad you are still responding to newer posts. Scenario being, the master BR is raised above the ground about a foot up to 2 foot, as there is a slope off of the main foundation, and this scratching occurs almost each night at about 3:20 almost like clockwork.The scratching, slightly possibly gnawing, is also heard in a closet transformed into a washer, dryer, space, opening in the living room in the LR that is back, to back with the master. Living room is on a granite block foundation also built off of the original house full basement foundation. House deed says 1935, pine beam construction, suggests otherwise. I have a cavity under the W&D that was put in a few years ago reworking the shelf of the original LR closet. I use a piece of wood directly beside the washer,and this stops the critter from working, only after a few tappa tappas. It starts again next night. I have 3 mousing cats, in the house, and I spread some kitty litter around the, well made, Pressure treated upright slats with 3/4 spacing and slightly larger spaces under the slats in some places, definitely not allowing large rodents, groundhogs, squirrels, large birds, or the like get into that enclosure around the master. Long winded story. What may be in there, unaffected by the litter? It is hard to know what the cause of the noises are. My suspicion would be on rodents (rats and mice) even though the cat litter would be a possible repellent. In my experience cats (even those that catch a lot of rodents) are not a good deterrent. Indeed they are often the culprit, bringing rodents into a home to 'play' with. I live in Ontario, Canada. Down south. My family lives in a little three story house and my brother and I both have rooms on the top floor, right below the attic. Around Christmas time my brother said he heard a scratching sound in his room, but my dad brushed it aside thinking it was a tree because it was too cold for a critter to be out. Now the scratching is back though, only it's in my room. It happens various times throughout the day. It was just scratching around 7:50 am for ten minutes. Usually I hear it around 1 in the afternoon but something later around 3 or 4 pm. Last night though I was up at 2 am and I heard the sound again. Sometimes I do hear scurrying but when my dad hit the wall before the thing didn't run away - it just stopped for 10 or so minutes then started up again. Any thoughts? Initially we thought it was a chipmunk but with the nighttime scratching we think it might be a mouse - my cats caught one outside before. I think rats or mice are the most likely cause but other animals such as chipmunks may also be possible causes. Also check your father's suggestion out and look for tree branches that might be touching the roof or eaves. If you fix some rodenticide in the loft you might be able to tell from any bite marks in it. I am really worried as I hear a scratching at around 10.30-11pm at night, it only lasts a couple of minutes then nothing (although it may happen once I am asleep) it is always in the same spot, same time and only lasts a few minutes (if that). It is not the birds walking around (I have a flat roof) as they are very distinctive. If it is insects surely that would last longer, I had the flat roof completely redone 2 years ago and this has just started. It is, however, on the join between my property and next door (or certainly that's what it sounds like). I am on my own and really quite afraid of ladders/heights so haven't gone up to take a look, but if you think it may be something destructive I will find someone to go up! It is very difficult to know what the cause of the noises could be. Is the timing at dusk? If so I would still consider birds even in a flat roof. They may have found a way into the space between roof and ceiling. Stand outside at dusk and/or dawn to see if there are any birds coming or going. Also look for overhanging trees. Another thing to consider is expansion/contraction noises from your roof as it cools. I know my house makes many such noises. Thank you David. It is not at dusk, 10.30pm is quite dark and I don't have any trees nearby. I think the answer is to find someone to go up and take a look, if it is insects boring through joists what would I expect to hear? Hi David, I'm in England. I first heard a scratching sound coming from the attic about a week ago at midnight and then again at around 3am. At first I thought it was the neighbour and i was imagining things. I heard nothing else since until about 7:45am today (it was light outside). Not sure what it could be with it happening in the middle of the night and the morning, what are your thoughts please? I think the most likely cause is a rodent (rat or mouse) but also check that there are not any tree branches that might contact the roof or eaves in windy conditions. Thanks David, the trees aren't close enough to be the reason so must be rodents. Heard scratching and scurrying again this morning at about 8.45am as I was leaving for work so I'll get someone brave enough to take a look for me! Thank you for your help. Im in Ireland Dublin. Im living in a house. My bedroom is located on the 2nd floor of a house. In the corner of the attic in bedroom I hear loud scratching an sometimes can be mild. I dont see droppings in the room. Fortunately I know im the culprit as i had food in the room,might aswell have invited them in. However my big question is weather its a rat or mice. Im extremely worried its a rat. I could handle mice. But rats i fear more as they could attack me personally when im asleep. Im really scared. Im staying at friends places for the noment as i cant sleep there. Im also worried I will lose my accommodation so i havent told my landlord the pest is above me bedroom, i told him it was in the hallway so he put up a trap. I hoped the rodents would follow from my bedroom to the hallway an die but they wouldnt an nothing in the traps. I feel terrible. I cant relax anymore. Just dont know what to do. If it was a mouse I could atleast sleep fine in the house but not a rat. Ive gotten mixed feedback online,so its hard to know which one its more likely to be. It is definately not a bird. Its a rat or a mouse. I just wish i knew which. Im too afraid to check the attic. I cannot tell whether the noises are from rats, mice or some other source. I recommend you contact your landlord and between you and he/she you work out a way to identify the cause and deal with it if it is a pest. Rodents and other pests are not ever the fault of just the landlord or occupant and often neither. Particularly if the home is flat, semi or terrace. It is to the advantage of both you and the landlord to deal with the problem. So I recommend co-operation. Hi I live in England, Yorkshire. For the last 1 week I can hear noises like fast walking only in one part of my ceiling. ( above the window). Only happens during day, starts at dawn and on and off during day, no noises during night.is it birds? Spring just started here and no noises during winter. How do I stop the noise any solutions? My guess is you are correct that this is the sound of birds walking on the roof or eaves. Or it could be something like squirrels. Take some time to stand outside and watch at the times that you usually hear the noise. It may be something heavy like gulls. If that is what it is it may not be a problem and not need any solution. If it it something you consider a problem let me know and I may be able to advise. I live near Sydney. If it is rats in my attic, why don't they eat (and die) my many large rat blocks I have put up for them? Is is maybe not rats after all? Do Blue Tongued Lizards climb into roofs and are active at night? The roof space was possum-proofed by a professional carpenter. So - what other animal could it be? A small cuscus? Thanks for suggestions. I am not an expert in what animals may enter roof voids in Sydney but lizards may be among the possibilities along with birds and rodents. If the bait blocks have not been eaten for more than a week i would consider it likely that the culprits are something other than rodents. Is it possible for nocturnal birds like owls to enter your home? And also, could it be possible that the rats/mice are building nests in my roof? It is possible but would be unusual for a bird such as an owl to enter your home. It is more likely that rats or mice would nest in your roof. My girlfriend is worrying because in her house she's been hearing noises. Sounding like scratching. Anyway this occurs around 7am, 4pm and other times during the day. She lives in a Terrace property, the noises are in the roof, loft area and near the front of the house. We live in England. Is this most likely to be birds? Yes. I think you are correct that the most likely cause of the noises is birds. I have had trouble with rats for some six months I told the landlord who got the Council in and put some poison in the attic roof. This has killed one or two but I can still hear rats running around the rafters and they have been getting in through the kitchen under kitchen units etc which I have blocked with plasterboad and I have done the same in the bathroom and in my lounge where they were scratching, my question is will the rats get through the plasterboard and wood that I have covered the holes with eventually as I am really on edge that they are going to chew their through again. It is important to get rid of the rodents before sealing up entrances/exits that they are used to using. Otherwise they will gnaw through your plasterboard sealing. Get rid of the problem and then seal up any possible entrances you can find. I hear scuttling noises early some mornings and have done so for sometime. This morning I discovered a small box of unopened chocolates that had been on the dining table , were in the floor and the packaging nibbled and eaten away at. You may be able to tell from the teeth marks in the chocolate whether it is rats or mice. The teeth marks of mice will be groves about 1 mm wide while those of rats will be 2-3 mm wide. Mice are more likely to be active in the living area of a house. Will they eventually eat through the ceiling and collapse my roof? We have to wait A WHILE before the Pest control guys get to our house on the waiting list. The last thing I'd want is to have my ceiling fall on me in the middle of my sleep. It would be very unlikely that rodents would eat through the ceiling and cause collapse. I am sure they can be dealt with before that would happen.